Sr. Rani Maria Vattalil will be beatified on Saturday, November 4, 2017, at Indore, the Catholic Bishop’s Conference of India announced November 2, 2017. Cardinal Angelo Amato, the Prefect of the Congregation for the Causes of Saints, will preside over the Ceremony. All four Indian Cardinals, the Apostolic Nuncio to India, nearly 50 Bishops and hundreds of Priests, Sisters and lay faithful will participate in the Solemn Ceremony. 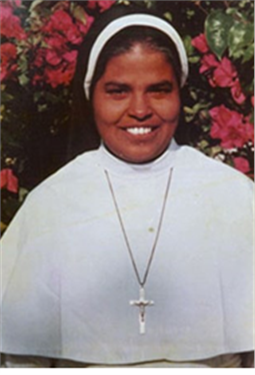 Sister Rani Maria Vattalil, a member of the Franciscan Clarist Congregation, was slain on 25th February, 1995. According to the Police, she was stabbed 54 times in front of more than 50 bus passengers in a jungle area near Udainagar (Madhya Pradesh) allegedly at the behest of moneylenders affected by the nun’s social work among village women, who were organizing self-help groups.